The premise is quite interesting. The story starts with Tanner delivering an extravagant display of Paragon’s new drone delivery system. Soon after, he met his old friend Amy to have an interview. The next thing he knew, he was in a dark dungeon, slave work awaiting. Every other word on the blurb hooked me into wanting to read it. The book was set in the mid 2020’s, so the world hasn’t advanced much in technology from today. The new tech pieces presented in the book weren't too fantastical, given that Google Duplex, Amazon Go, and Boston Dynamics exist today. 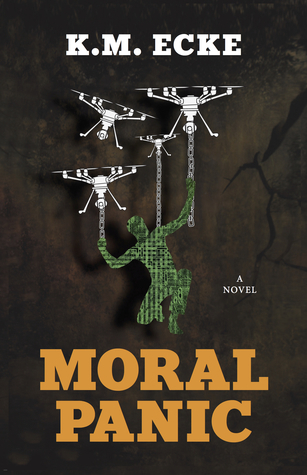 It was disappointing that Tanner and company didn’t delve deep into the technicalities of the drone systems or some other tech, but I understand that this book isn’t about that. Even then, I just can’t stand the clue Tanner used to discover how exactly he was framed. File metadata just doesn’t work that way. He could have obtained some samples that have typos in their name. He could have accidentally heard the audio clips before they are published. He could have found the file saying it was modified a ridiculously long time ago. He could just happen upon the neat row of the manual input date in his desperate viewings. But… May 130th? Really? That’s cheap. Someone should be fired for that. The lack of red herrings ruins the mysterious thriller feeling. It felt more like dystopian sci-fi, without the thriller. My guessings were as not enjoyable since there were only a handful of meaningful picks for the antagonist. What roles everyone(!) other than Tanner fit into can be guessed shortly after, especially for Diana and Heather. The intro section of the book left little to the imagination. However, considering that this is a 250-pages book, that might just be good pacing. Maybe I'm just rooting for a longer book. I finished reading it in about 5 hours, quite a short read for my standards. Sam felt more like a deus ex machina for Tanner rather than a genuine character, stuck together by circumstances. He seems to have all the answer to Tanner’s philosophical questions. His intro was the most jarring of all; in a room full of antisocial, he’s the wise guy in the middle of it. It broke the oppressive atmosphere and my suspension of disbelief. Can’t the other engineers (aside from Jordan and Kurt) be more useful in the conversations? There’s only a bunch of them, it wouldn’t hurt to have them give their own ideas. Despite what I said about the lackluster introduction, Amy’s side-plot was entertaining. It was a satisfying read, even though Amy’s sacrifice felt worthless to the main plot. The tension only lasted few pages. Her ending was a dark, cruel joke, spat on Tanner’s face. I love it. As a protagonist, Tanner doesn’t seem to be as fleshed out as the others at the beginning relative to their importance to the story. Granted, the point of the story revolves around Tanner (and Sam) questioning how morality works, developing Tanner’s personality in the process. (Also, y’know, the whole in medias res thing left little chance anyway. ) This is offset by his detailed thought process throughout the book. There were times when his thoughts were clear and rational, and then there were times he was completely played by his enemies. It's fun reading the latter parts. Hunter’s portrayal as a religious fanatic struck a cold tone in my heart. His delusion of grandeur, combined with the illegitimate justification from twisted religious texts and his own personal revenge, results in a murderous person with a wicked moral. I like his backstory and how he evolved to be the Hunter he was, but I don't get how he's doing his job so easily for so long. It's almost as if the author didn't think of other secret societies’ existence. As for the main point of the book, I’ve been always too sidetracked by Sam’s apparent wisdom on the problems Tanner have to keep tabs on the thought-provoking parts of the book. They did talk about the ethics of their (well, mostly Hunter’s) doing, touching on whether they should do what they do, how it feels to them, yaddada. While it served as good justification for their actions, I still think it lacks the slap-to-the-face kind of provocation. Or maybe I’m just desensitized to these points. Surveillance, fake news factories, sociopolitical engineering, sinister people with the power and will to gain their goals. Great, any new news? Moral Panic would serve as a good reminder that the dystopian future is happening now (or at least in the coming days), for anyone that hasn’t realized yet. Overall, it’s not a bad idea to spend your time reading Moral Panic. I enjoyed the book, and the flaws were minor enough to keep me reading through and off my other distractions for my lazy Saturday evening. Go pick up the book if you enjoy the slow-boil serving of justice.